We know that cannabis has been used as a natural remedy for thousands of years. Today, scientific research corroborates this knowledge, which is continuously extending. Cannabis as a medicine is considered as a palliative for symptoms of diseases such as fibromyalgia, neurological diseases like multiple sclerosis, glaucoma, effects of cancer treatments, to treat certain types of chronic pain and for some autoimmune diseases, etc..
Cesamet, name which recieves the Nabilone on the market, is a synthetic analogue of THC, which is not the same as synthetic cannabis, i.e. it presents the same structure to be identified by the recipients but with some changes in its composition. Nabilone was introduced in the mid-80’s in the United States and was then removed at the end of that decade. It was used as an antiemetic, to alleviate symptoms such as nausea and the consequent vomits from anti-cancer treatments. Valeant Pharmaceuticals International, based in California, bought the patent in 2004 and brought it on to the market under the name Cesamet ® during the middle of the last decade. It was also sold in Canada, Australia, United Kingdom and Ireland, extending then to other countries, but not as a drug of first choice. 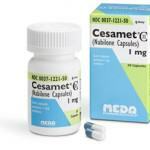 Cesamet ® is available in a bottle of 20 capsules with 1 mg or 1.5mg of nabilone. 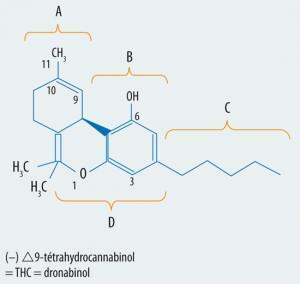 There is another synthetic equivalent of THC called dronabinol; it has the appearance of a brown oil and is administered in glycerine capsules of 2.5, 5 and 10mg. It is marketed under the name Marinol ® in the United States, South Africa, Australia and New Zealand. It has the same particulars as Cesamet ® and is also used to alleviate the symptoms of anorexia / cachexia syndrome in patients with HIV or terminal cancer. We must say that synthetic cannabinoids have shown side effects when not used with their THC antagonists, such as CBD and others – which serves to counteract some effects – so they decided to make extractions directly from plant being in order to mantain the range of cannabinoids as much as possible. number of known, standardised and homogeneous cannaboid, which basically contains delta-9-tetrahydrocannabinol (THC ) and cannabidiol (CBD). A dose of 0.1 ml contains 2.7 mg of THC, 2.6 mg of CBD and 5% of other cannabis derivates. It is administered sublingually by spray-application, and it is sold in bottles of 5, 5 ml with 51 applications. It is aimed, for the moment, at patients with multiple sclerosis and to treat pain in cancer patients. It was patented by the British laboratory GW Pharmaceuticals at the beginning of the last decade and marketed by Bayer and Laboratorios Almirall; this last laboratory is carrying out a pilot-test in Catalonia. We can see that this kind of treatments with synthetic cannabis derivates have a limited use within the medical cannabis scene. Many therapeutic consumers maintain a firm stance on using only the marijuana plant. For them, cannabis remains as the best way to treat their ailments. Their attitude is the spearhead against the greedy interests of the big pharmaceuticals in taking advantage of the emerging world of medical cannabis and its great economic potential. 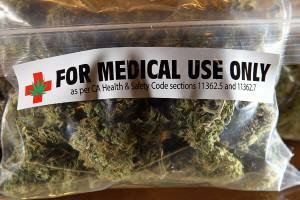 Due to my orthopaedic and neurological illness, I have been looking for Medical Marihuana. Some might say, why don’t you grow your own? Well problem is, that my gardening skills are Zero and nothing grows. I don’t have a “Green Thumb”, so to speak. Medical Marihuana does ease my health problems much better than common medicine from the doctors. I am glad to see, that sites, as yours, gives a lot of information for people same as me. thank you all and stay healthy at all times. I have to encourage you to keep trying to grow your own marihuana, yourself or with someone that could help you with the crop. When you smoke your own weed it gets better, believe me 😉 Thank you! I just wanted to know what the difference in pain relief when it comes to marinol and sativex? I am know takeing Marinol for extreme back spasms but I have just herd about Sativex and want to have some info for my Dr.
Marinol (dronabinol) is a synthetic form of cannabis, commonly used to treat nausea and vomiting, loss of appetite and weight loss. 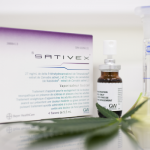 On the other hand, Sativex is derived from cannabis plants and is usually prescribed to treat spasms and pains. Perhaps you could try Sativex, it seems to be suitable for your symptoms. Either way, we will always recommend speaking with your doctor about it. Where can I purchase these pills? Can anyone help me? Starting in 1999 my fifteen year old son was diagnosed with cancer. 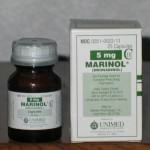 At that time Marinol was used extensively at the hospital where he was treated. The synthetic Marinol had no effect on pain, nausea, or weight gain. Had I known the benefits of Marijuana at that time I certainly would have seen that he had access to it. Brad passed away in 2004 after five years of suffering with extensive pain and having to be fed through a tube. After Brad passed I was given access to the real deal, Marijuana. The benefits of this ‘humble little plant’ that was given to us by a higher power has been a life saver. The physiological benefits of Cannabis is another benefit that is not yet covered. Canada is now allowing a spray into the nose which is made from Cannabis and not a synthetic. America is controlled by the pharmaceutical companies and it is this dominance of the market that is preventing the curing of disease. People have the right to receive a natural substance to help them and not a ‘synthetic made-in-the -laboratory’ drug that can never deliver the benefits of Cannabis. I could not agree more with your remarks. People not being allowed to use a substance that would heal them is unfair and perverse. Economic interests should never be placed before individuals. Hope one day we’ll finally have the right to choose our medicines and won’t be forced to buy other medicines anymore. Those of you that speek about pharmacical companys don’t realize how correct you are. By their standards I don’t qualify for dronabinol. However I am a kidney transplant patient in rejection being told I’m malnutrition, have been hospitalized 4 times in the last 2 months for nausea, vomiting & dehydratedtion. They can place as feed tube ( which still doesn’t work for me) but can’t get dronabinol approved because I don’t have cancer or HIV. How do they know for sure I don’t have some form of cancer my immune system is so suppressed. I myself have experienced daily nausea and vomiting for more than 3 years. Cannabis helped me in a way that any medicine could do, it was perfect to relax my stomach and neck muscles after vomiting 5-6 times. I really can’t understand why only cancer or HIV patients can have access to cannabis, it is as ridiculous as unfair. MANY people could be taking profit from cannabis to heal their medical conditions, it is time that we realize that it is forbidding a substance that heals people what perhaps should be considered a crime. I really hope you can improve your health status. I have severe chronic intractable pain, due to toxins from some jaw joint implants, goqing back 32 years. I have found that CBD helps, but that THC exacerbates the pain. Is Sativex too THC-heavy for my needs? Also, my state has no access to medical marihuana, yet. Can you recommend the best option for me? If you found that CBD helps but THC donesn’t (it happens the same to me with my migraines sometimes, some strains work but others just seem to increase the pain) then I would try CBD extracts rather than Sativex. We don’t know your laws there, but all these products are 100% legal in Spain since they don not contain sufficient amounts of THC to be considered a drug. Unfortunately, we still don’t ship our products to the USA, we hope that will change soon. Each 100 microlitre spray of Sativex contains 2,7mg THC and 2,5mg CBD, plus 0,04% alcohol (ethanol). From our side, we’ll keep on fighting so people like you can have the treatment you want for your medical conditions. Hope you can find a solution. Good luck with our fight; thanks for your work. The last information we had was that Marinol is legal in Australia, although you’ll probably need medical prescription. Hi ?The Dr. Gave me cesamet for pain. How would I go about getting approved for medical marijuana? Can u get it prescribed on line, or do I physically have to find, go to a Dr to make a prescription? I live in Ontario Canada. I really don’t want to get back on opiates (took me 11yrs). If someone knows, ID really appreciate it! 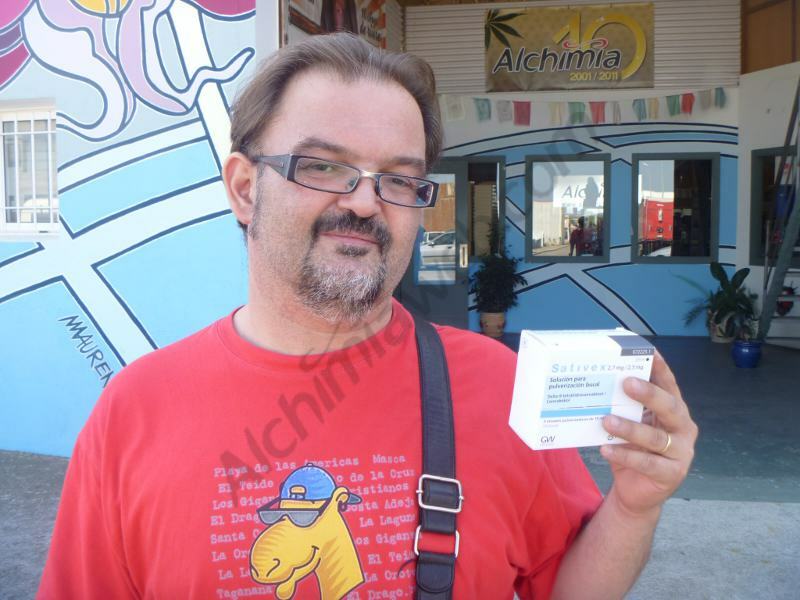 Hi, is it possible for my Doctor, Neurologist or the Royal Adelaide Pain Clinic to get Sativex for me in South Australia and would it be expensive or on the PBS if available please. I have Multiple Sclerosis. Thank you. I hav fibromyalgia & epilepsy also pcos opiates & opioids do not work. It is very hard 2 try & get any type of cannaboids in newzealand so thinking I may hav 2 grow my own even tho illegal. The pain relief is so much better from cannabis I think it’s wrong that sumthing so natural is so illegal. It is a shame that thousands of patients around the world are not allowed not only to treat their conditions as they want, but also to grow their medicines at home. Perhaps is because of that, because if you grow your medicine at home you’re not buying medicines from big pharma companies. As I said, it’s absolutely shameful. Hope you won’t have problems for trying to treat your disease…all our best thoughts! I have been given nabilone (cesamet) for prevention of migraines and I have to say after years and so many different meds it is working so well. I used to have daily pretty much I’ve only had a couple in the few months I’ve been taking it. I have smoked in the past to relieve a migraine but I like that this prevents and doesn’t make me feel high or go to sleep when I don’t want to. I however have terrible insomnia that is exacerbated it seems by the last two meds they had me on. Thoughts on combining smoking g with the nabilone? I am thinking to talk to doc about mm because I know that MJ will put me to sleep and I don’t want them to switch me off the nabilone for the above reasons.. There is one important factor that you should be aware of: during the combustion process when you smoke, lots of compounds are released. These compounds decrease the anti-migraine properties of cannabis notably, something that doesn’t happen when you vaporize the plant material instead of smoking it. Thus, the first advice for anyone using marijuana to treat migraines is “do not smoke it but vape it!!”. About combining Nabilone and marijuana: I assume there won’t be any problem, Nabilone is composed of a synthetic cannabinoid which mimics THC. Also, notice that there are hundreds of cannabis strains with different effects, so while some Sativas are extremely stimulant, most Indicas will put you to sleep almost instantly. If you’re using cannabis you must be aware of that and know what you’re smoking. A little bit of trial and error will surely let you to know what strains work best for you. Of course, you should ask your doctor about it. I have had ongoing chronic insomnia for over forty years (I am Seventy five) and take strong sleeping pills which only now help if I have at least three glasses of wine. THis gives me a decent sleep, but don’t always feel marvellous the next day but certainly preferable to lack of sleep. I would like to cut down on the intake of alcohol as of course this is too much on a daily basis, and an was wondering if medicinal marijuana or cannabis would be a miraculous aid to my sleeping problems? Hi Valerie, thanks for your question. Your hunch is correct, cannabis can indeed be a godsend to sufferers of insomnia, with indica-dominant Kush varieties being consistently recommended for this purpose, although I’d recommend you to try a few different things for yourself to see what works best for your situation. Users have reported great success using cannabis tinctures or edibles of some kind before bed, which can be a healthier alternative to smoking cannabis. I hope that helps you to reduce the alcohol and sleeping consumption somewhat, best of luck. Hi Rose, you’ll really need to talk to your doctor about that, I’ve searched but I can’t find Cesamet available anywhere online. I have read that it is banned in Ireland, but I can’t find any clear information. However, according to wikipedia, Sativex has been approved for prescription in Ireland since 2014, although I’ve read that it hasn’t yet been prescribed to anyone. Hi there – I was diagnosed with occipital neuralgia some time back and have started weening myself off the medication as a result of the symptoms still being present. We are in the process of trying to grow our own plant and are currently trying recipes to ‘cook’ bought product with coconut oil to strain out the active ingredient. While this project is something different and fun for us, what is availble in South Africa in terms of a store bought ‘medication’ that we can use in the interim? Thanks very much. No, we can’t sell these medicines, we can only sell CBD products. Hi Linda, I’m afraid it’s not possible to order Dronabinol here, you’ll need to be prescribed it by a cannabis-friendly doctor to be able to buy it in Europe. The best advice I can currently give you is to search online for a Medical Cannabis Consultation near you. Best of luck.